The Innokin Slipstream Atomizer Coils are authentic replacement atomizer heads for Innokin's Slipstream Sub Ohm Tank, Kroma Starter Kit and Coolfire Ace Starter Kit. This 5 pack of replacement coil heads are made available in two different styles, allowing you to try one or both to find which will provide the results you are looking for. The original coil included with the Slipstream Sub Ohm Tank is the 0.8 ohm Kanthal BVC atomizer. This coil is designed for use with variable wattage devices, allowing for an output range of 20-35W. Innokin's Slipstream 0.5 Ohm coil option features a SS316L heating element and organic Japanese cotton wick. The versatile stainless steel heating element gives you the option of using either variable wattage or temperature control output with best results found within the range of 320-446°F. 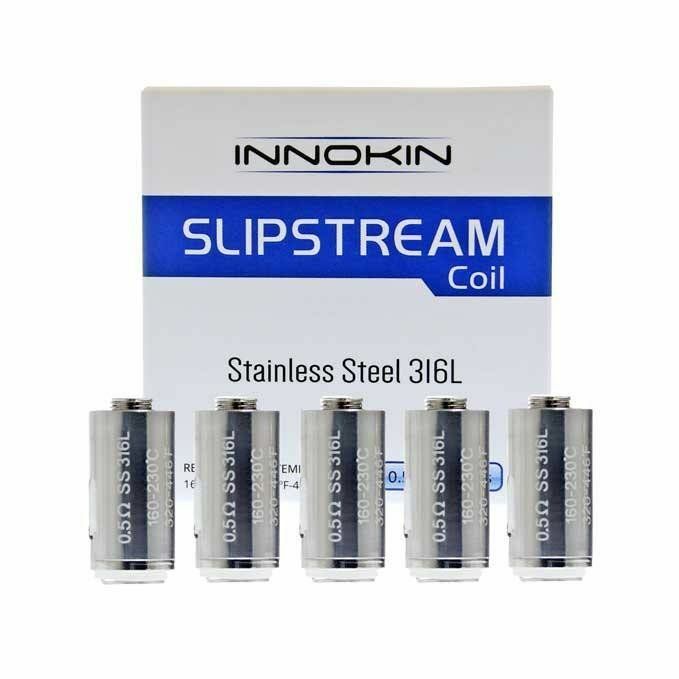 Quickly restore your Slipstream vaporizer to it's former glory with this 5 pack of long lasting atomizer coils from Innokin.